The number of exorcisms has been rising sharply in Italy, with some 500,000 Italians requesting an exorcism each year and not nearly enough exorcists to meet the rising demand, according to recent reports. The archdiocese of Milan in northern Italy has doubled the number of its exorcists, while an exorcism hotline has been launched in Rome, but those in the field claim it isn’t nearly enough. 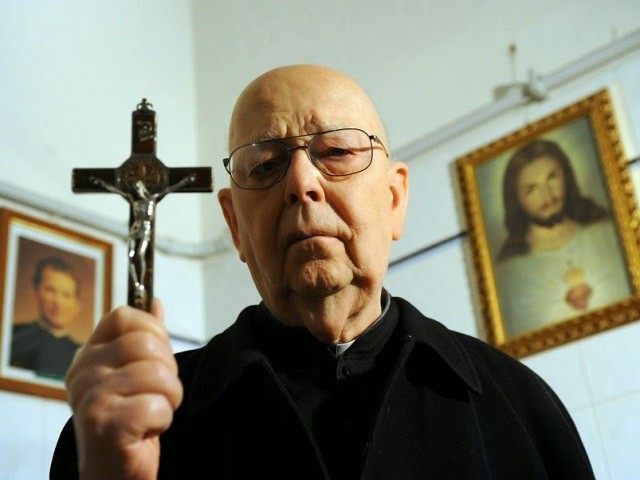 Rome’s most famous exorcist, Father Gabriele Amorth (pictured), died last month and his successor, Father Vincenzo Taraborelli, says that he cannot keep up with the daily requests for liberation from demonic influence. “Padre Vincenzo,” as he is known, handles some 30 “clients” a day, and is calling on the Church to appoint more priests as exorcists to share in the mission of satanic deliverance. Last month, an Italian documentary on exorcism called “Liberami” won the award for “best film” in the Venice Horizons category at this year’s Venice Film Festival, drawing still more attention to this rapidly growing industry. In her film, director Federica Di Giacomo’s explores the exorcism efforts of Father Cataldo, a veteran exorcist in Sicily who is sought out in increasing numbers by Catholics who suspect they may be tormented or possessed by the devil. Just south of Rome, in the diocese of Frosinone, exorcist Father Ildebrando Di Fulvio receives a constant stream of people asking for help “countering the strength of the devil” in the Cistercian abbey where he works. The priest also noted that often people become possessed after participating in séances or Satanic masses, or after joining Satanic sects and cults. Father Aldo Buonaiuto, an exorcist in the northeastern Catholic diocese of Fabriano-Matelica, shares Di Fulvio’s concerns. According to the priest, some 10 million Italians have consulted wizards, witches, fortune tellers, and astrologers at least once in their lives. “Most of them are charlatans who dupe desperate customers, but among them are some Satanists,” he said. As “tools of the trade,” every exorcist carries a crucifix and holy water, and there are established deliverance prayers and rites used for the exorcism itself.